From dangerous winds and curling scandals to wardrobe malfunctions, there’s been no shortage of attention-grabbing headlines at the 2018 Winter Olympics. And for ardent supporters of Team USA, the big story is America’s lagging medal count. We’re over halfway through the games, and currently the US sits in fifth place behind Norway, Germany, Canada, and the Netherlands. Based on last week’s performance (and Mikaela Shiffrin’s recent withdrawal from the women’s downhill event), it’s hard to know for sure how America will place. However, we can use predictive analytics to determine the main predictors of medal count to anticipate which countries will generally be on the podium. We’ll use TreeNet modeling to identify the main drivers of medal count based on previous Winter Olympics outcomes. For the sake of simplicity, we’ll focus on the 2014 Sochi winter games (excluding all Russia data which would skew the model!) 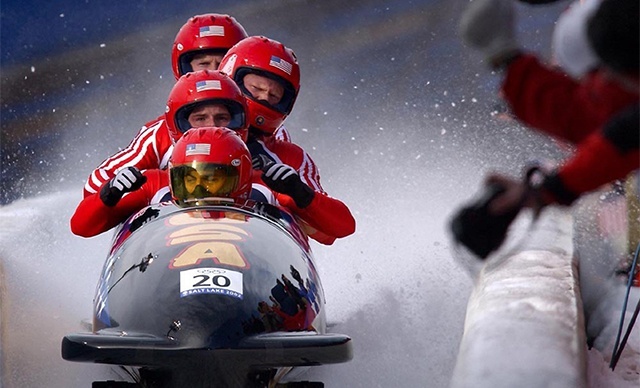 From there, we can infer similarities between medal drivers for Sochi and PyeongChang. Please note all these results are hypothetical, and not reflective of actual data! To successfully run a TreeNet analysis, you need both a dependent variable (e.g., the outcome you are trying to predict) and independent variables (e.g., the input that could be possible predictors of the dependent variable). 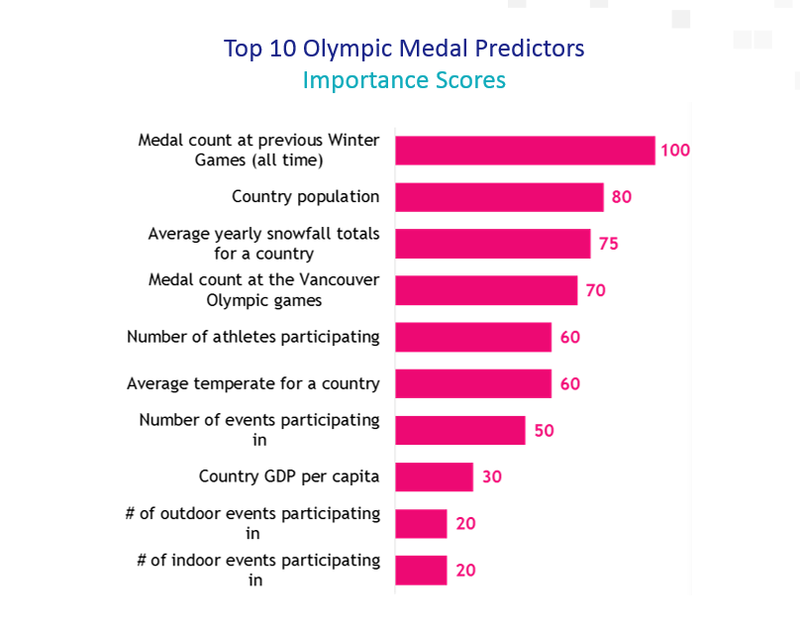 Meaning, in this sample output, previous medal history is the top predictor of Olympic medal outcome with a score of 100 while # in outdoor events and indoor events participating in are the least predictive. This is a fun and simple example of how we could use TreeNet to forecast the Winter Olympic medal count. But, we also leverage this same technique to help clients predict the outcomes of some of their most complex and challenging questions. We can help predict things like consideration, satisfaction or purchase intent for example, and use the model to point to which levers can be pulled to help improve the outcome. Jen is a Sr. Project Manager at CMB who was a spectator at the Sochi winter games and wishes she was in PyeongChang right now. There’s always a lot of debate in the weeks leading up to the NFL’s announcement of its regular season MVP. While the recipient is often from a team with a strong regular season record, it’s not always that simple. Of course the MVP's season stats are an important factor in who comes out on top, but a good story also influences the outcome. First, make a framework: Having a framework for your research project can help keep you from feeling overwhelmed by the amount of data in front of you. In the MVP race, for example, voters should start by listing attributes they think make an MVP: team record, individual record, strength of schedule, etc. These attributes are a good way to narrow down potential candidates. In research, the framework might include laying out the business objectives and the data available for each. This outline helps focus the narrative and guide the story’s structure. Then, look at the whole picture: Once the data is compiled, take a step back and think about how the pieces relate to one another and the context of each. Let’s look at Tom Brady’s regular season stats as an example. He lags behind league leaders on total passing yards and TDs, but remember that he missed four games with a suspension. When the regular season is only 12 games, missing a quarter of those was a missed opportunity to garner points, so you can’t help but wonder if it’s a fair comparison to make. Here’s where it’s important to look at the whole picture (whether we’re talking about research or MVP picks). If you don’t have the entire context, you could dismiss Brady altogether. In research, a meaningful story builds on all the primary data within larger social, political, and/or business contexts. Finally, back it up with facts: Once the pieces have come together, you need to back up your key storyline (or MVP pick) with facts to prove your credibility. For example, someone could vote for Giants wide receiver Odell Beckham Jr. because of an impressive once-in-a-lifetime catch he made during the regular season. But beyond the catch there wouldn’t be much data to support that he was more deserving than the other candidates. In a research report, you must support your story with solid data and evidence. The predictions will continue until the 2016 regular season MVP is named, but whoever that ends up being, he will have a strong story and the stats to back it up. Jen is a Sr. PM on the Technology/E-commerce team. She hopes Tom Brady will take the MVP crown to silence his “Deflategate” critics – what a story that would be. Recently the WNYC podcast “Note to Self” (@NoteToSelf) released a week-long challenge to its listeners aimed at curbing information overload in our daily lives. 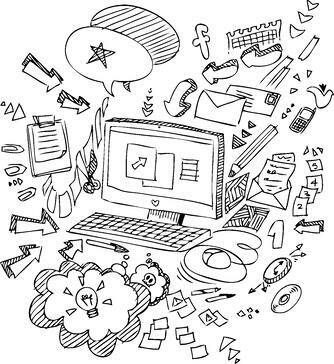 In today’s internet-driven society, we’re hit from all angles with information, and it can be difficult to decide what information or content to consume in a day without being totally overwhelmed. I decided to participate in this challenge, and as the week progressed, I realized that many of the lessons from this exercise could be applied to our clients—who often struggle with information overload in their businesses. Challenge 1: “A Magical Day” – No multi-tasking, only single-tasking. This challenge centered on focusing on one task at a time throughout the day. I knew this was going to be a struggle right from the start since my morning commute on the train typically involves listening to a podcast, scanning the news, checking social media, and catching up on emails at the same time. For this challenge, I stuck to one podcast (on the Architecture of Dumplings). By the end of the day, I felt more knowledgeable about the topics I focused on (ask me anything about jiaozi), as opposed to taking in little bits of information from various sources. Research Implications: Our clients often come to us with a laundry list of research objectives they want to capture in a single study. To maintain the quality of the data, we need to make trade-offs regarding what we can (or can’t) include in our design. We focus on designing projects around business decisions, asking our clients to prioritize the information they need in order to make the decisions they are facing. Some pieces may be “nice to have,” but they ultimately may not help answer a business decision. By following this focused approach, we can provide actionable insights on the topics that matter most. Challenge 2: “A Magical Phone” – Tidy up your smartphone apps. This challenge asked me to clean up and organize my smartphone apps to keep only the ones that were truly useful to me. While I wasn’t quite ready to make a full commitment and delete Instagram or Facebook (how could I live without them? ), I did bury them in a folder so I would be less likely to absentmindedly click through them every time I picked up my phone. Organizing and keeping only the apps you really need makes the device more task-oriented and less likely to be a distraction. Research Implications: When we design a questionnaire, answer option lists can often become long and unwieldy. With more and more respondents taking surveys on smartphones, it is important to make answer option lists manageable for respondents to answer. Often, a list can be cleaned up to include only the answer options that will produce useful results. Here are two ways to do this: (1) look at results from past studies with similar answer options lists to determine what was useful vs. not (i.e., what options had very high responses vs. very low) or (2) if the project is a tracker, run a factor analysis on the list to see if it can be paired down into a smaller sub-set of options for the next wave. This results in more meaningful (and higher quality) results going forward. Challenge 3: "A Magical Brain" – Avoid a meme, trending topic, or “must-read” today. I did this challenge the day of the Iowa Caucuses, and it was hard to avoid all the associated coverage. But, when I looked at the results the next day, I realized I was happy enough just knowing the final results. I didn’t need to follow the minute-by-minute details of the night, including every Donald Trump remark and every Twitter comment. In this case, endless information did not make me feel better informed. Research Implications: Our clients often say they want to see the results of a study shown every which way, reporting out on every question by every possible sub-segment. There is likely some “FOMO” (fear of missing out) going on here, as clients might worry we are missing a key storyline by not showing everything. We often take the approach of not showing every single data point; instead, we only highlight differences in the data where it adds to the story in a significant and meaningful way. There comes a point when too much data overwhelms decisions. The other two pieces of this challenge focused on verbally communicating the information I learned on a single topic and setting a personal information mantra to say every time I consumed information (mine was “take time to digest after you consume it”). By the end of the challenge, even though I didn’t consume as much information as I typically do in a week, I didn’t feel like I was missing out on anything (except maybe some essential Bachelor episode recaps), and I felt more knowledgeable about the information I did consume. Jen Golden is a Project Manager on the Tech/E-commerce practice at CMB. She wishes there was more hours in the day to listen to podcasts without having to multi-task. I recently traveled to Sochi, Russia for the Winter Olympics (check this off the bucket list!) and after all the media attention focused on Sochi leading up to the games, I was interested to see firsthand if the games were going to be considered a success for Russia or not.Russia went into their Olympic bid with the mindset that they would be showcasing, and essentially re-branding, their image to the world (and turning Sochi into a top tourist destination in the process). Re-branding an entire country is no small feat (and in the west many would argue that Russia faces a particularly difficult battle) and the Olympic stage is indisputably the easiest way to gain national exposure and leverage a positive image. Pre-Olympics: Sochi got off to a bit of a rocky branding start in the media (with security and hotel/lodging concerns taking the spotlight away from the positive aspects of the games) and #SochiFail being the most prominent twitter tag in the weeks leading up to the event. Strolling through the Olympic Park a day before the Opening Ceremonies, many aspects were not yet set-up and ready to go (e.g., the souvenir store, sponsor houses, food stands). Nothing like last minute! Olympic Moment: After the Olympic Ring debacle during the opening ceremonies, Sochi brought its A game. The international media had little to complain about (besides the sunny weather! ), as events went off without a hitch and portrayed Russia in a positive light. 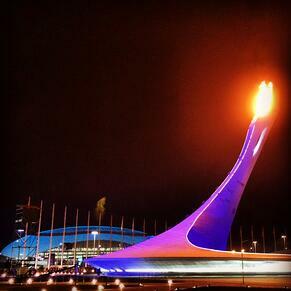 Post-Olympics: From purely a spectator’s point of view, the games for Russia were a success. The venues were state-of-the-art, Sochi provided wonderful scenery, volunteers were friendly and focus was centered on what mattered: the athletes and bringing the world together for these two weeks. Russia also achieved their ultimate branding goal as a nation: coming out on top of the medal count. But in an illustration of the limits of Olympic spirit, Russia’s current political actions may taint any positive goodwill they gained from Sochi. In the wake of the Games, will Sochi become the ultimate tourist destination that Russia hoped for, or will it suffer like other Olympic cities have in the past? Speaking to other spectators who had been to multiple Olympics, many expressed these were the best Olympic Games yet…but only time will tell if that positive experience was felt throughout the world (or if it never made it outside the ring of fans and athletes in Sochi). Jen is a Project Manager at CMB. She’ll never forget her Olympic experience and is now preparing herself for PyeongChang 2018. When the 820 consecutive home game sell-out streak ended on April 10th at Fenway Park (just two games into the 2013 season), the Boston Red Sox found themselves in a unique situation…Red Sox brand loyalty was no longer just a guaranteed thing.Since the Red Sox won the World Series in ’04 and again in ‘07, brand loyalty has come easy to the team – the fans were just there, happy to support their world champions. But after a rocky end to the 2011 season and a weak 2012, loyalty has waned and the organization actually needs to re-build that loyalty again. So where do they start? 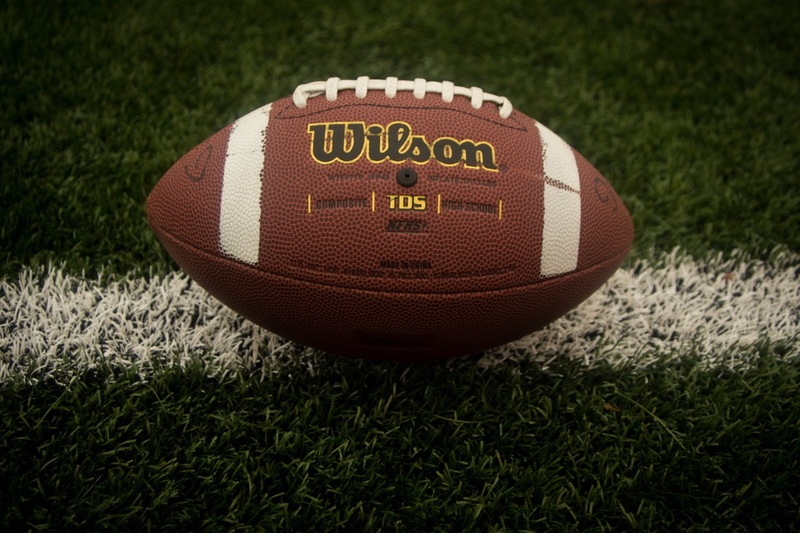 Obviously on the field actions play tremendously into brand loyalty of any professional sports team. If the team is winning, fans will come to cheer them on and if the Red Sox continue their already hot start to the 2013 season that may help to re-build the loyalty all in itself. But besides just winning games and acquiring new and exciting players to drive fans into the ballpark - what have the Sox done to keep Red Sox Nation committed and coming back to the brand? Commitment to the brand’s heaviest users: A new loyalty program has been put in place for the brand’s repeat purchasers (i.e., the devoted season ticket holders who come to game after game). Enrolled into a tiered loyalty program, they can earn points towards rewards (such as throwing out the first pitch at a game) every time they scan their loyalty card at the ball park or make a purchase at a concession stand. By committing to their heaviest users and brand advocates, the Red Sox are aiming to keep their best customers happy. In-Game Promotions: To show fans they are valued and appreciated, the Red Sox put promotions in place at food stands around the ballpark for the start of the season, including Kids Eat Free and $5 Beers. 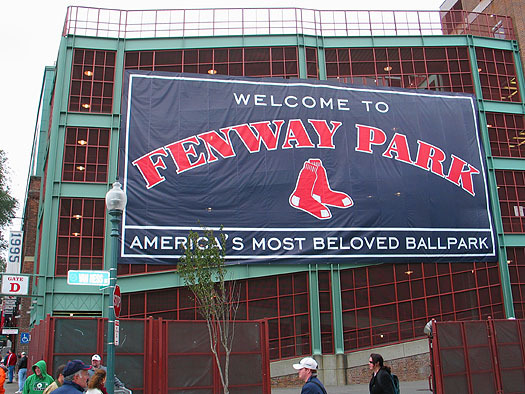 Even with high ticket prices, these promotions might drive both new and old fans into the ballpark and provide them with a great customer experience once they are in the door of friendly Fenway Park. Rebuilding brand trust: Maybe most importantly, the Red Sox have campaigned to bring trust back to its fans. The Red Sox have always had brand loyalty— even in the 86 year stretch without a World Series win – but trust kept those fans believing that soon their suffering would be over. After the 2012 season, many fans were left feeling that the team had quit on them and weren’t committed to winning. 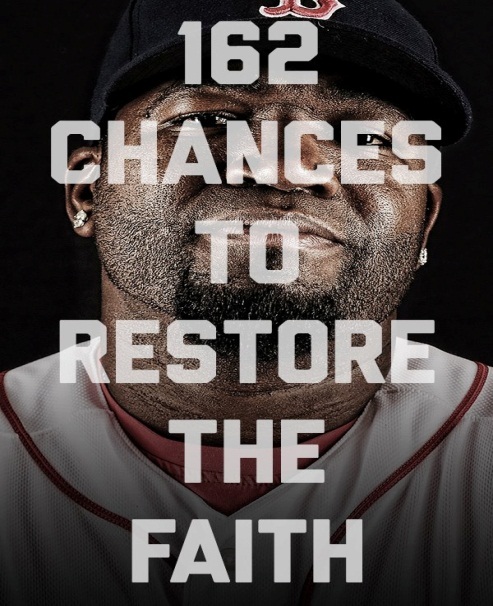 To combat this mentality in 2013, commercial, print advertisements and billboards showcase players with the message that “What’s Broken Can Be Fixed” and “162 Ways to Restore the Faith.” New manager John Farrell has also promised to do everything he can to help the team win. However, while this assurance and transparency with the fans is reassuring off the field, the team now must follow through with this commitment on the field to truly gain back the trust. Professional sport teams are a unique brand; sometimes no matter how much loyalty the Red Sox organization might try to create – advertising, loyalty programs, promotions, none of it will matter without a competitive team on the field. However, it’s times like this when the Red Sox can show their dedicated fans they really are valued. They must maintain their brand advocates and deliver on their promise of a committed ball club in order to keep Red Sox Nation faithful even when the League Standings on the Green Monster might show the Red Sox slipping a few games behind the dreaded Yankees. Jen Golden is a Senior Associate Researcher at CMB. She’ll never forget the first time her Dad took her to her first Sox game and she saw the Green Monster for the first time – her brand loyalty for the team has never wavered since. Interested in joining our team? We're hiring, check out the opportunities here on our Career page.